Made during the September of 1896, this movie is a simple comedy, displaying the ability to get a laugh in just a short time and without the benefit of sound. It reminds me somewhat of “The Sprinkler Sprinkled,” although I wouldn’t call it a remake. 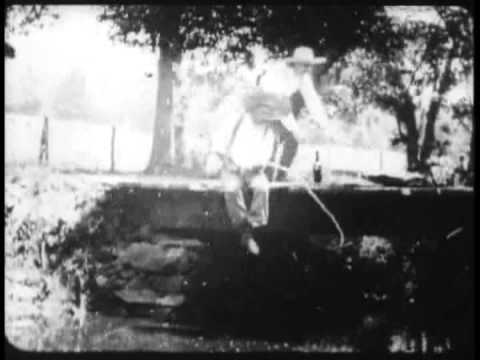 A fellow in a Huck Finn-like costume sits down on a bridge, with a fishing pole and takes a quick swig from a bottle. Then, another man walks up behind him and tips the board he is sitting on, dropping him into the stream below. At that point, a horse and buggy pull up, and the passengers get out to laugh at the fellow in the drink. This is an early example of adding a “laugh track” to a movie to play up the humorous effect by giving the audience someone to laugh along with. At the end, the miscreant voluntarily jumps into the water and approaches the camera, apparently saying something, perhaps to the cameraman or the audience about what he has done. It was shot on location in Fanwood Park, not far from the Edison studio, showing that the Edison Company was beginning to think about taking cameras outside of the Black Maria at this point.